LAS VEGAS – That was not what Carlee Pierce had planned. On Sunday night during the fourth go-round of the Wrangler National Finals Rodeo, Pierce and her horse, Lola, posted their fastest time around the cloverleaf pattern. They also suffered the first penalty of this year’s championship. “We just got a little tight on the second barrel,” said Pierce, who finished in 19.03 seconds after suffering a five-second penalty when the barrel hit the ground. But the Edmond, Okla., cowgirl has maintained a positive attitude, despite the fact that she’s placed just twice and has pocketed just a little more than $11,000 – that’s considerably different than Fallon Taylor, the No. 1 barrel racer in the world standing who has earned nearly $50,000 in four nights. That’s the best part, and history tells a fascinating tale. Two seasons ago, she finished the season No. 2 in the world standings after earning more than $79,800 in Las Vegas. She won the sixth and 10th go-rounds. 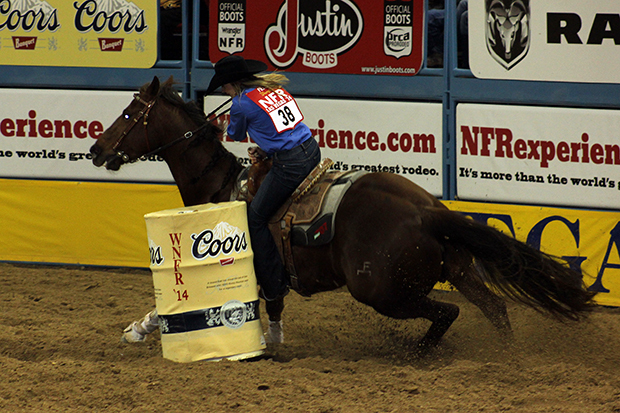 In her first NFR in 2011, she scored a then-arena record 13.46-second run to win the fifth round. That means the door remains wide open.